In the electric power sector, load shapes refer to the varying amounts of electricity required over time. Daily load shapes vary by region, climate, and time (daily, monthly, seasonally). 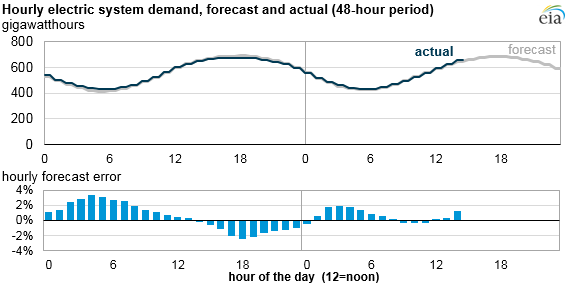 Each day, balancing authorities—the entities charged with balancing electric supply and demand—forecast hourly electricity demand on their system for the next day. Using these load forecasts, they can develop resource schedules, or plans for the use of available power plants to generate the power needed to meet demand. Because actual demand for electricity can differ from the day-ahead forecast and can vary within the hour, balancing authorities work with electricity generators to ensure that they can adjust output immediately to match generation with real-time demand. In some areas, the operators can also work with demand aggregators to call upon demand response. Demand-response programs reduce electricity demand, typically at large industrial facilities, as another tool to maintain the supply-demand balance. This balance is essential to ensure the reliability of the power system and to provide end users with a stable supply of electricity. The alternating current (AC) power system—nearly everything connected to the transmission and distribution grid, from power plants to home appliances—is designed to operate at a frequency of 60 cycles per second, or 60 Hertz. If supply and demand fall out of balance, the AC frequency will increase or decrease, a condition that can cause system components and consumer equipment to fail. To prevent permanent damage, the power system is designed to isolate any problem and protect itself. In the most extreme situations, this imbalance can result in a widespread blackout. Operating load levels at each balancing authority are usually recorded as hourly averages instead of as instantaneous values. Balancing authorities calculate the total system demand in their area by adding the net generation from most of the generating fleet and subtracting or adding the interchange (the flow of electricity into or out of the area). When actual demand significantly exceeds forecasted levels, balancing authorities call upon generating capacity held in reserve. This can indicate that the electric system is under stress. However, when actual demand is significantly lower than forecast demand, the system has over-committed generation capacity, which can be costly for electric consumers.